The month of January 2019 has been one of the biggest percentage move for January since the 1980s if I am not mistaken. The oversold condition plus long term support help to send it higher. Oil prices have also bottomed and this contributed to the massive rise in January. I believe the month of February will not experience a rise such as in January due to the massive resistance overhead that needs to be overcome. But still the market is not easily intimidated by the resistance. So we might be looking at a slow drift higher. Good morning guys and hope you had a wonderful day yesterday. The Dow has been trading sideways a bit these past few days and I think it is giving us a clear reference point by now. 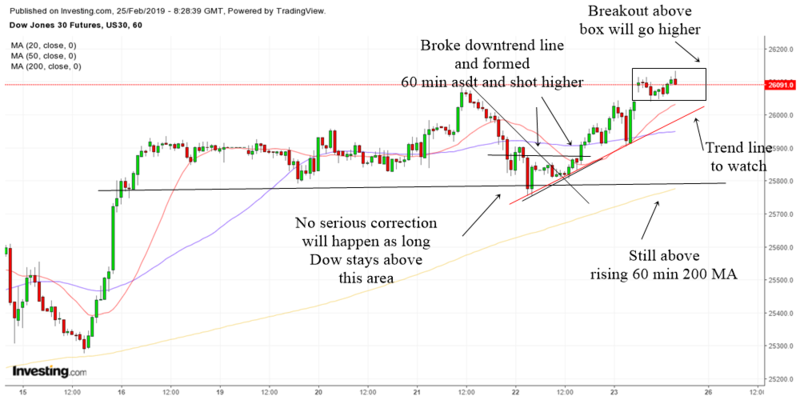 We can draw a trend line connecting the highs of the 60 min Dow movement. If Dow can trade above this trend line, then it is likely to move higher. Some kind of a double bottom has formed as well. If Dow drops below this double bottom formation we treat it as dropping below a support area. Then more selling might happen. Dow is still meandering in the smaller time frames. No weakness yet in the daily uptrend but the chart of 60 min Dow futures shows sideways trading. I'm looking at the downtrend line at the moment. If Dow can trade above it then perhaps it will move higher. But if Dow drops below the rising 60 min 200 MA then we might have a correction lower. The stock market has almost made a miraculous move back up. With good news from Trump and China, this can continue to propel it higher. Take a look at the chart below and you will see how much Dow has recovered. The chart above shows the daily chart of Dow Jones futures. The trend is up. It has traded back above its 200 MA. A sign that long term bullishness is back. The short term 20 MA is still pointing up and rising. As long as the market is above the rising 20 MA, it will chug higher without any serious correction. But do be careful of choppiness when the 20 MA is breach. Does not mean the market will fall but just that it may need to trade sideways a bit after it breaks below the 20 MA. There is a recent bullish green candle. As you can see, the previous 4-5 candles are trading at the top 1/3 of the green candle. In fact actually it is trading right above it. This tells us there is a picture of bullishness and not many want to sell. 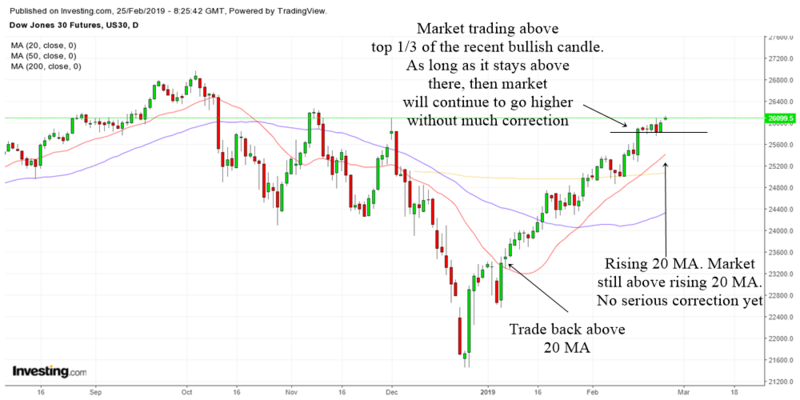 I believe that as long as the market continues to trade above the top 1/3 no correction will happen but it will continue to move up and perhaps even make all time highs. Now lets take a look at a trader's point of view. Traders will need to look at shorterm term charts such as the 60 min chart above. The twists and turns are indeed trading opportunities. 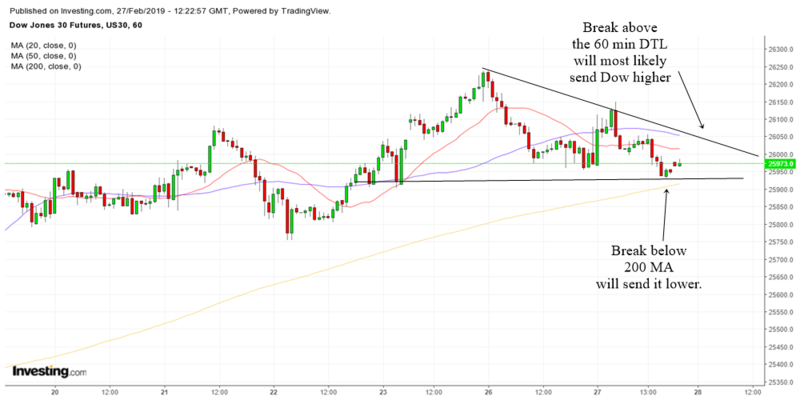 The most recent one is where the Dow drop to support area, broke above a downtrend line and break above a 60 min ascending triangle for a nice nice rally up. It is meandering at the previous high and perhaps might form a trading box. 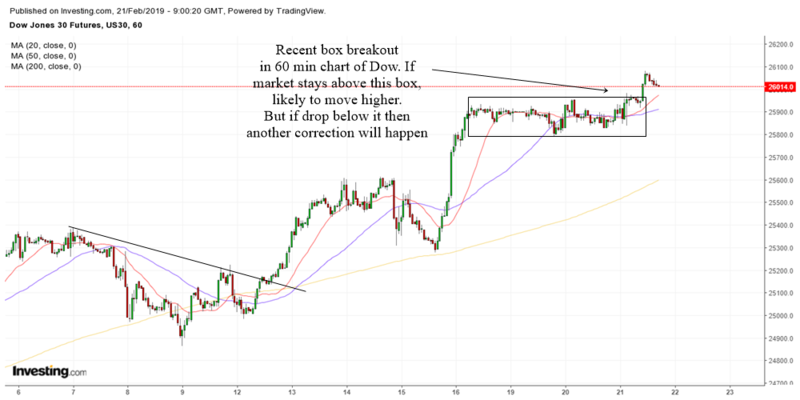 If it can break above the box then it will experience a 60 min breakout and once again send the market higher a day or two. Do start to be cautious if it drops below the red uptrend line. Small corrections might happen. But I think as long as it does not drop below the horizontal support line which coincides with the top 1/3 of the daily green candle in the daily chart, then no serious correction will happen. The market will continue to chug higher slowly but surely. Since the last time I published on the market, the Dow has managed to break above its daily downtrend line. This is a positive development and tells us that the long term bull market is alive and kicking. There are a few positive things going for the Dow. Some fundamental news are the negotiations between the Democrats and Republicans and also China and US trade negotiations. 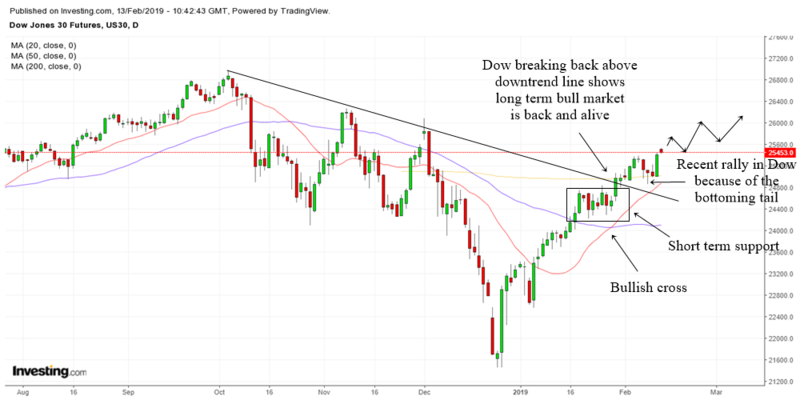 On a technical side, the Dow has had a bullish cross, a break above the downtrend line and a recent box breakout. The box will act a short term support and as long as Dow stays above this box then we will continue to move higher. The move up this past few days happen because the Dow formed a bottoming tail at the top of the box. 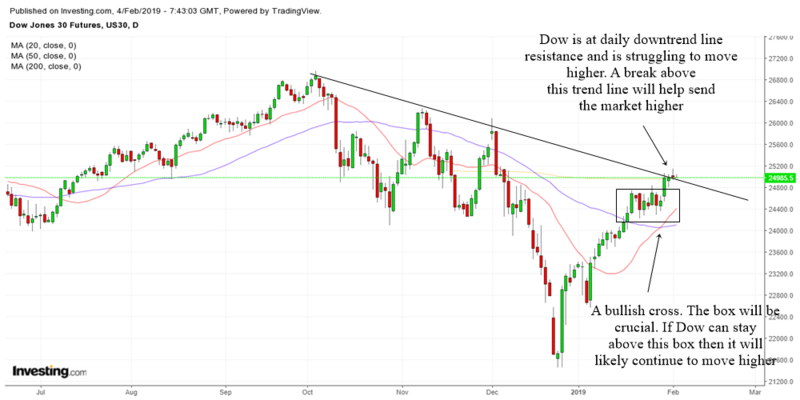 Since there is still resistance overhead, it is likely that if Dow moves up it will be a wavy like pattern. Up a few days and then down. That is acceptable and is good to absorb the supply. The dips like what happened a few days ago are great opportunities for traders to buy the dips. 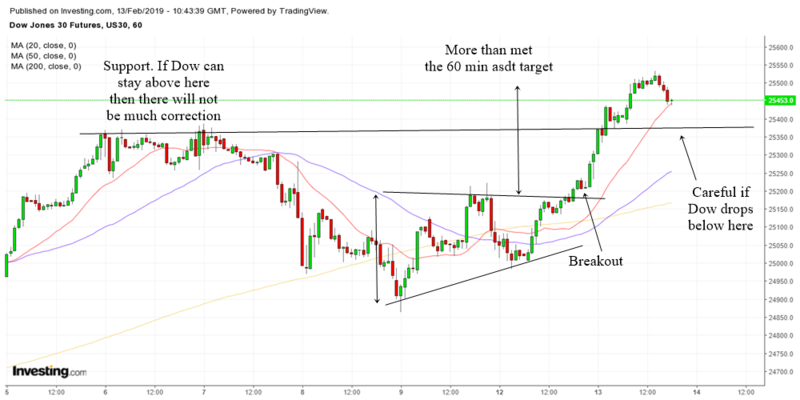 Looking at the 60 min chart of Dow futures, we can see that it experienced a 60 min ascending triangle breakout and it has more than met its target. Which is why there is some selling. The previous high support area will be important to determine if we will have a deeper correction or just a sideways trading before going higher. If Dow can stay above the support area, then we are likely to move higher. Now we turn to our trusty 15 min chart red zone white zone. When SPY is in red, its not a good idea to initiate swing longs. But the past few days have seen it trade back into the white zone. Which is why swing longs are still ok. 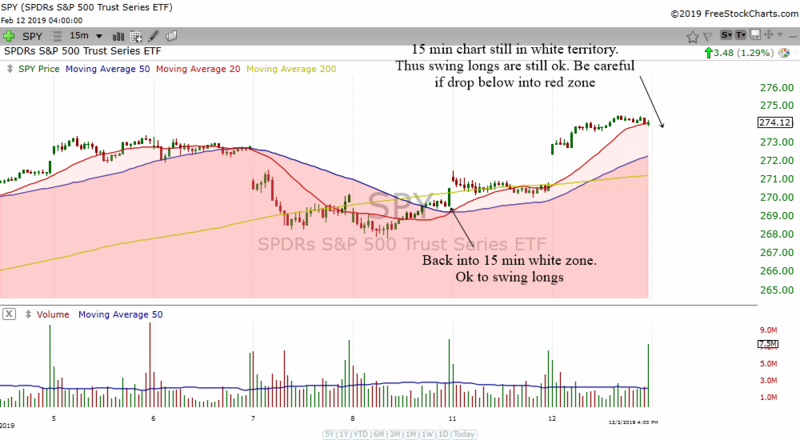 But do be careful not to enter into swing longs when SPY trades below into the red zone. The chart above is the daily chart of Dow Jones futures. As you can see, the Dow is now currently at a downtrend line resistance. Which is why it is struggling to go up. If it can break above this downtrend line, then Dow will continue to go up. The area to take note is the box I have drawn. Along with a bullish cross, this box tells us that Dow is not intimidated by the resistance. Otherwise it would have fallen down instead of trading sideways. As long as Dow can stay above the lows of this box, we will be looking at higher prices for the Dow. Next on our list of positives for the market is the fact that Apple might be starting a new stage 2 daily uptrend. Notice how the stock has bottomed forming a kind of box that I have colored in green. After earnings, the stock gap up above this box. The top of this box will be support. 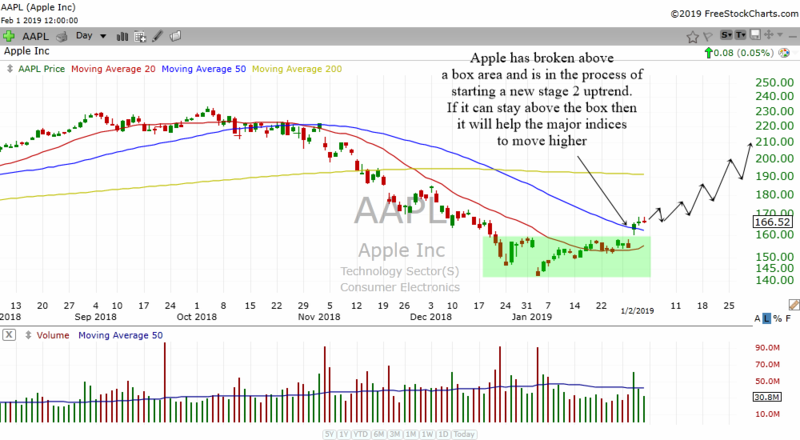 I believe that as long as Apple can stay above this box then it will drift higher and because Apple is such a crucial component of all 3 major indices it will have a positive impact on the direction of the stock market. The above is the weekly chart of SPY. Take note of the massive resistance that I have highlighted in red. It will take some time to overcome this. Which is why I believe February will probably not experience such a rapid rise compared to January. Supply or resistance areas need time to be absorbed. The bottoming tail that formed at the resistance area tells us that the S&P 500 is not intimidated by the resistance. 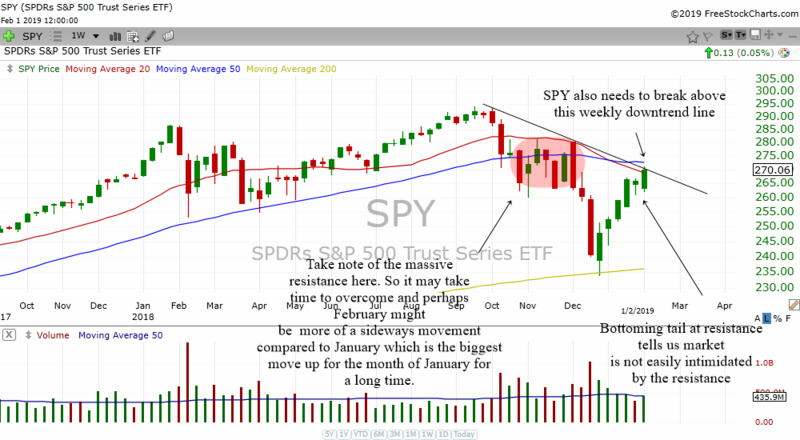 Which is good news and if SPY breaks above the downtrend line then things will be positive for the market.